Handmade in beautiful Jewel Calf, English Bridle & Croc Leather this gorgeous Business Card Case will elegantly and securely hold either business cards or credit cards - or both. There are two separate compartments within a gusseted centre section, the front section being smaller than the back section. This leather credit card case is not only beautiful but also extremely hard wearing and will always keep its shape and look good for years to come. The inside is luxuriously lined in contrasting plush soft-suede! 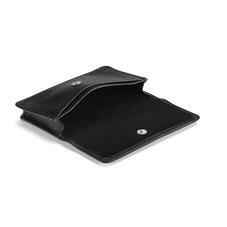 To hold credit cards & business cards up to 4 inches wide and 2.5 inches high. Sophisticated, elegant and beautifully stylish. Closes with a flap and secure snap closure. The Aspinal Business Card Case can be personalised with up to 4 initials.